A Classic Text Back in Print! Although major advances have occurred with prepress and press technologies in recent years, the underlying principles of successful color reproduction remain fundamentally the same. With this in mind, PIA/GATFPress reprints Principles of Color Reproduction, the classic text on the topic. 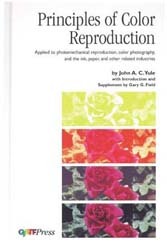 First published in 1967, it was a landmark event in the evolution of photomechanical color reproduction theory and practice. Here, for the first time, was a complete treatise on the scientific and technical aspects of color reproduction written specifically for the printing industry. For this special reprint edition, an introduction and update chapter written by Professor Gary G. Field supplements the original text. Each adds a timely dimension to the book, covering recent developments in the industry and augmenting its value as a reference tool. About the Authors: John A.C. Yule, formerly research associate at the Rochester Institute of Technology and, before that, at the Kodak Research Laboratories, Rochester, New York, was born in Bradfield, England. He received a B. Sc. degree in 1927 from the Royal College of Science, London, and a D. Sc. degree from London University in 1967. In 1968 the Institute of Printing in England awarded him its first Gold Medal for this research on the theory of color photography and halftone processes, and he became a Fellow of the Society of Photographic Scientists and Engineers in 1974. Dr. Yule has written many papers on the theory of color reproduction and halftone processes, and he holds a number of patents on the photographic aspects of color reproduction, on color scanners, and on halftone screens. He is the inventor of colored mask film (Kodak Tri-Mask Film) and co-inventor of prescreened film (Kodalith Autoscreen Ortho Film). He retired in 1975 and resided in Prescott, Arizona, with his wife June, enjoying his many hobbies which included international folk dancing, hiking, and music. Gary G. Field is Professor of Graphic Communication at the California Polytechnic State University in San Luis Obispo, California. Professor Field, who earned technical qualifications from the Royal Melbourne Institute of Technology, the Nottingham Trent University, and the City and Guilds of London Institute, also holds Accredited Senior Imaging Scientist professional status from the Royal Photographic Society. He has authored three books and over 80 papers on the subjects of color reproduction, print quality, color imaging, and related topics. The Technical Association of the Graphic Arts, the Institute of Printing, and the Graphic Arts Technical Foundation have each awarded their highest honors to Professor Field in recognition of his research contributions.